Have you ever thought about what it really means to “be present”? Is it simply being visible…being there? To our Sisters, it means being an active part of the moment…as Jesus became “present” to humankind when he was born on Christmas Day. He wasn’t just visible, just there. He engaged with those around him…showed us how to live, how to be part of every moment in life, even how to die. While Jesus no longer walks among us in physical form, He is made flesh every day through each believer who follows His commandments of love. We feel that this is true of our Sisters who continually strive to make the love and compassion of Jesus present wherever they serve. We feel this is true of you, too. When you live your life fully, help those in need, and are present to those you love, you embody Jesus. We come to you today with the hope that you can again be “present” to our elder and infirm Sisters. As you know, one of our most important priorities is to ensure these Sisters are well cared for. As is typical for those of advanced age, one or another of our Sisters always seems to be experiencing a new medical issue. Each year, as the cost of almost everything increases, it becomes more of a challenge. We struggle to make ends meet, while remaining good stewards of all the gifts with which we are blessed. Without you and your generous assistance, especially to our elder and infirmed Sisters, it would be very difficult to meet our Sisters’ many and varied needs. There’s no way we can adequately express to you how much your continuing care and loving support means to them! You have truly been an amazing gift to our elder Sisters! 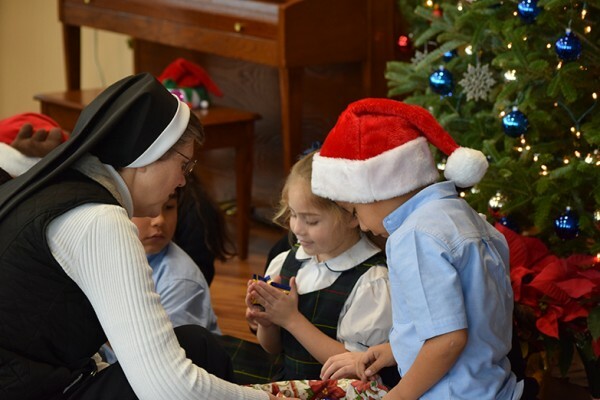 At this special time of year, would you continue to be “present” for our Sisters….by praying for them, writing to them, and by sharing your resources with them? They really count on you…spiritually and financially! Perhaps you would consider making a gift in memory of a loved one or in honor of these Sisters who have devoted their entire lives to making this world better? Our online donation form lists suggested amounts, but any gift you can share with our Sisters will be appreciated. (Visit the Donate page on our website to access our online form or to download a mail-in form). When you make your gift, be sure to complete the prayer request portion to let us know your intentions. Our Sisters spend many hours praying for all of the intentions you’ve sent to us. On behalf of the Sisters of the Holy Family of Nazareth, we wish you, and all whom you hold dear, an Advent filled with hope and a joyous Christmas season to follow. PS: Be sure to place your op?atek and Holy Family Novena booklet orders soon so they will arrive in time for your Christmas celebrations.